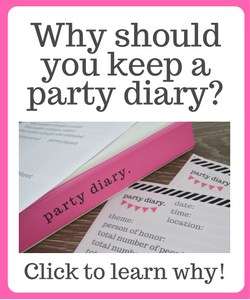 Are you ready for all of the fall celebrations? Our neighbors to the north in Canada have already celebrated their Thanksgiving. Even here in Florida we have fall festivals happening every weekend! Are you an early Christmas shopper, starting to check out sales and such? I don’t have to do much Christmas shopping to do, but I am making sure I have the dishes I want for Thanksgiving and Christmas meals and starting cookie baking season with some Halloween cookies this week! 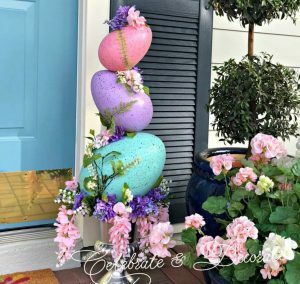 Enjoy your week and thanks for stopping by Celebrate and Decorate! Fall Decor in the Dining Room from Across the Boulevard caught my eye as a feature this week. 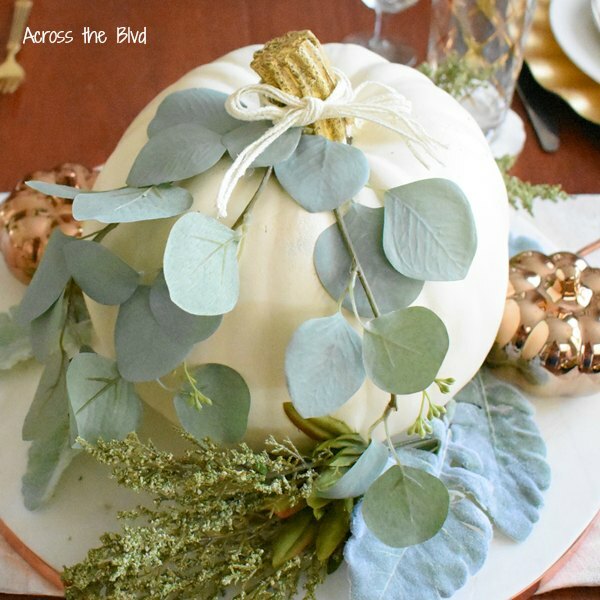 The copper accents shared by Beverly are perfect for a Fall table, and I like her centerpiece of a white pumpkin adorned with eucalyptus too! 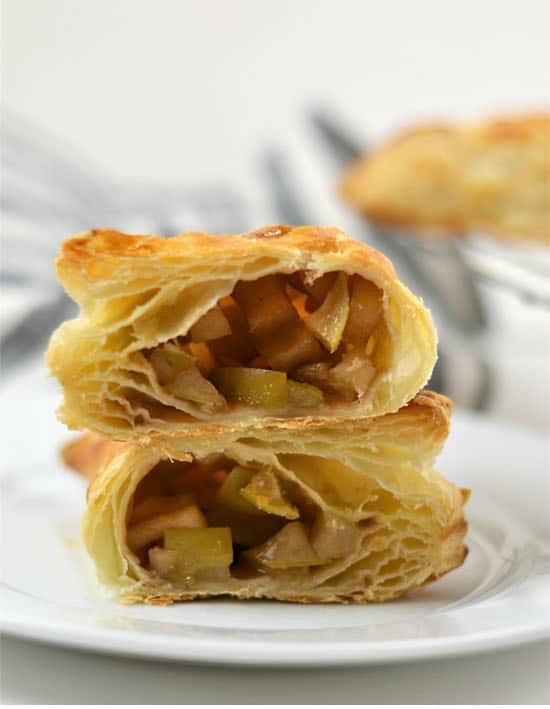 Sandra’s selection to feature this week is these amazing Easy Puff Pastry Apple Turnovers from Burlap and Blue. I am not the baker Linda or Sandra are, but I think I can even master these! What a perfect fall treat! If apple turnovers aren’t calling you, how about the White Almond Cake With Creamy White Almond Frosting. Pattie from Olla-Podrida was all set to make a German Chocolate Cake when she took a detour. Kari picked this one out for her feature for a good reason! 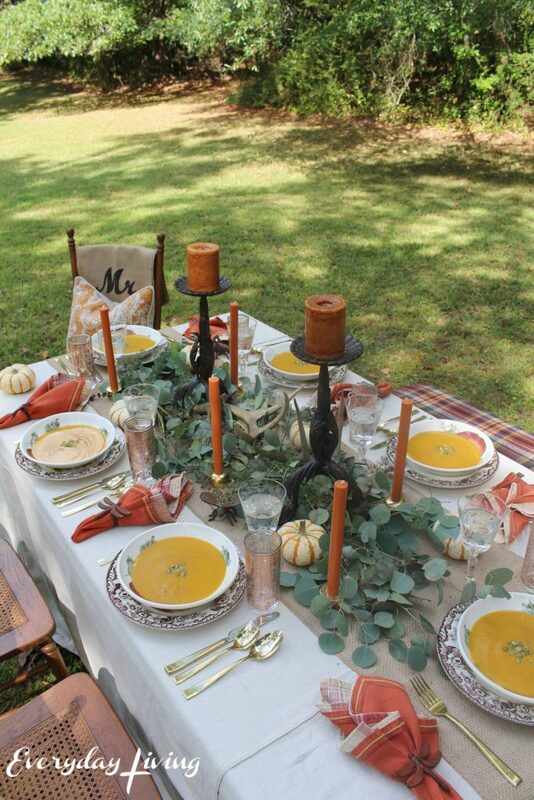 The most clicked link this week was the 13 Festive Fall Tablescapes from Everyday Living. You won’t have to look too far to get some inspiration for setting your fall table once you peruse Pam’s collection of lovely tablescapes! Chloe, isn’t that eucalyptus so pretty on that white pumpkin? Great features. It’s that white almond cake that has my mouth watering though……yum! Thanks, lady, for hosting us and sharing each week. 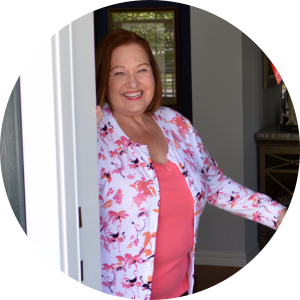 Thanks so much for featuring my Fall Decor in the Dining Room! I’m delighted you liked it. Thanks for the party each week, Chloe. Lots of fall festivals going on here, too. Even though it’s still not feeling very fallish. Hope you have a wonderful week ahead. hi Chloe! 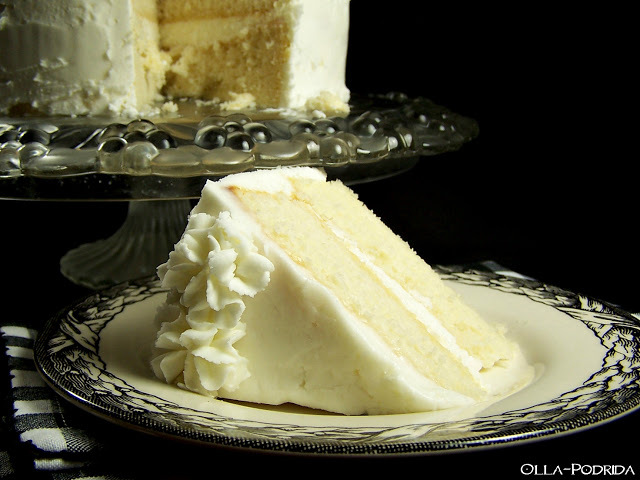 I sure wish I had a piece of Pattie’s white almond cake right now, my very favorite cake flavor! 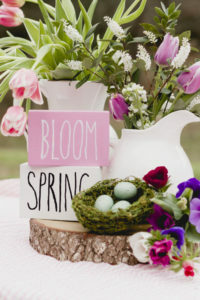 Thank you for hosting this party every week and all the fabulous tablescape hops! I can’t wait for the fun next week! 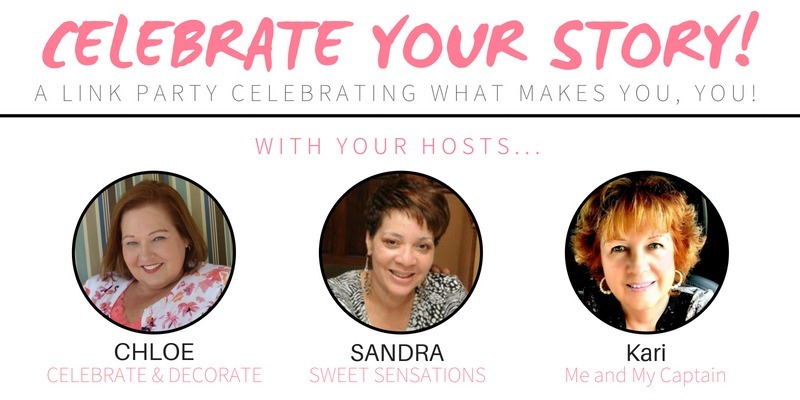 Thanks so much for hosting and I am always honored to be featured. Have a wonderful week! Such gorgeous features this week! Thank you for letting us party with you! Thanks for hosting, yet again. I always find such wonderful inspiration here. Thanks, as well, for the feature.